Linkelectronics has recently released the world’s first and only RFID smart door lock that works without direct contact: the lock automatically recognizes the key over a distance of 50cm to 1m. The major advantage: You no longer have to put in a password or hold the RFID card against the door. Linkelectronics was established in 2001 and is a South Korean high-tech manufacturer of digital door locks for commercial and residential applications. The door locks use passcodes and RFID systems for one-touch and wireless opening, and they are equipped with sophisticated safety features. Especially, Linkelectonics is competitive in comparison to other companies on digital door lock circuit development and electric circuit production. 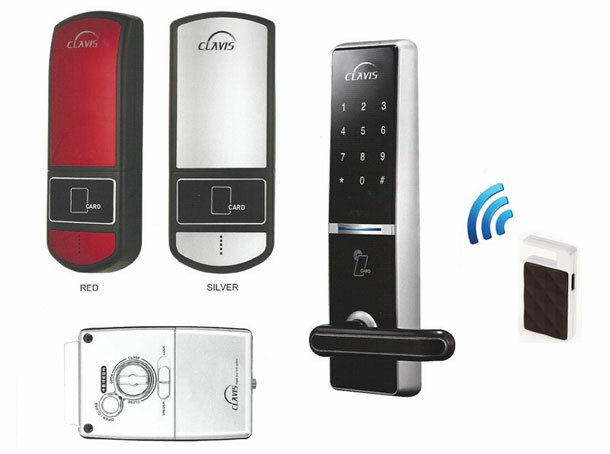 It also sells its own digital door lock brand named “Clavis” worldwide. The company is now interested in expanding into more potential markets across the world. We are certainly living in the world where security is under serious threat. It seemingly continues to haunt people on a daily basis. Once people with ill-intention break into our home or company, it always deals a significant blow; leaking companies’ confidential information could mean the end of their businesses, and people can lose their valuable properties or even lives. Of course, people can rely on police officers, but they still cannot rest assured. Maybe, they might want to believe in I-BILIV. I-BILIV started helping people tightening their security in 2006. As one of competitive manufacturers for digital locks in Korea, it has since then offered various high quality items to the global market. MNR301 is a 3-way digital door lock with a grey metal look. This elegant and sleek model can be accessed with smart cards, touching, and main keys. Its Anti-Panic allows users to open with only one touch. Your transportation card or credit card can be useful as MNR301 is programmed to register and accept them. It runs on 1.5v batteries and weighs 3.9kg. IM100 comes with a touch pad and can remember up to 100 smartcards. It has a built-in anti-static device. MTR701 shines with its black appearance while an attached red-colored number pad is glowing with a big contrast. The model has also 3-way Access and Anti-Panic function, and it requires 1.5v AA batteries. MTR601 is called “premium grey metal beauty” and supports quite the same features that the other models have. It weighs 3.9kg. There are also sub door lock models SNC-400R, SNR-400B, IS100 & IS200, and STC-500R. For more information, you can visit http://i-biliv.com. If you want more information about ‘Digital Door Lock’, please contact us.